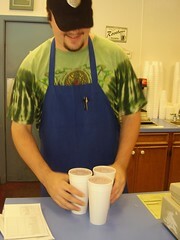 RRBJ is all about supporting small home town businesses. When visitors come to town they are looking for authentic Shreveport and Louisiana experiences. Some cities are organizing to keep up the awareness of the small guy/gal. That's how that Keep Austin Weird slogan came about. Even movie stars are looking for the best local experience they can have. 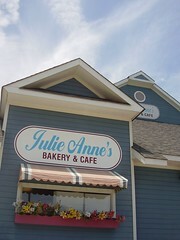 While in town filming Mad Money Katie Holmes spent plenty of dough at Julie Anne's Bakery and Cafe, located at the corner of Line Avenue and Kings Highway. Her Shreveport snacking habits made it into People magazine and Maggie Martin covered it in her blog. 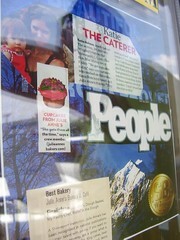 Just this month SB magazine listed the bakery as the best in town. It also rates high with the folks at the LSU Health Sciences Center School of Medicine Shreveport. While there's plenty on the menu that's tasty, our current fav is the raspberry lemonade. Becky -- They look good. I stuck the email link up there at the top. Thank you. I've got some photos of the reading I haven't uploaded. When I do I'll shoot you an email. Keep blogging and let the world know what SB Land writers are doing.